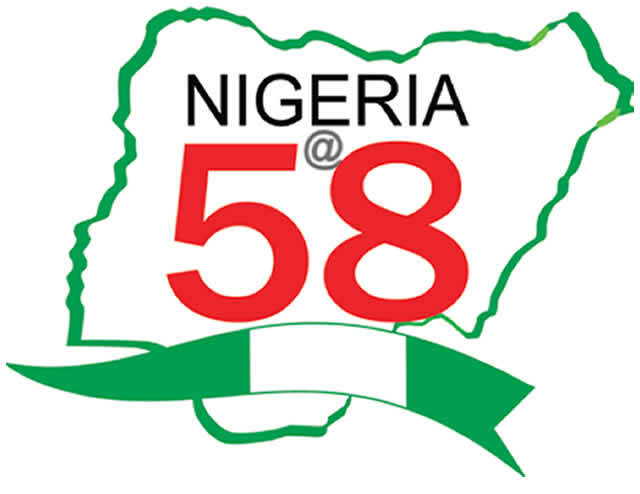 As Nigeria celebrates its 58th independence anniversary today, two sectors where successive administrations have failed to register impressionable achievements happen to be the oil and power sectors. With a population of over 170 million people, the country was through these years battled with less than 7,000 megawatts of electricity, leading to massive power shortages that have blighted industrial development and job creation. Despite being Africa’s largest economy, Nigeria still lags behind South Africa that generates over 40,000mw of electricity to support its industrial base, commercial entities and private consumers. More worrisome to the citizens in the wake of these poor showings was that the high hopes raised during former President Goodluck Jonathan’s power privatisation programme which was expected to deliver reliable and steady power supply to the citizens. But five years after the unbundling of the Power Holding Company of Nigeria (PHCN), the situation has gone from bad to worse with power investors threatening to dump the asset should government fail to address some of the issues plaguing the sector. The investors have continued to canvass for the implementation of a cost-reflective tariff, which they said had taken a negative toll on their business and has hindered them from carrying out a comprehensive overhaul of obsolete equipment. Recently, the Minister of Power, Works and Housing, Mr. Babatunde Fashola, told power investors to deliver electricity or be ready to quit. But the power investors, represented by the Executive Director, Research and Advocacy, Association of Electricity Distributors (ANED), Mr. Sunday Oduntan, fired back saying the Federal Government on its part had reneged on its promises in the agreement it signed with the power investors, saying the investors are equally willing to surrender the assets for a refund of their monies. In all of these, the consumers and manufactures have been the ones bearing the brunt of inefficiency of the power sector as they are made to cough out about N3 billion monthly in estimated billing. The situation in the oil sector is not different from what obtains in the power sector given that Nigerians have failed to reap the benefits of this natural resource. Since oil was discovered in commercial quantity in Oloibiri, in present day Bayelsa State, in 1956 and exports commencing in 1958, the sector has been enmeshed in one trouble to other, with host community issues and environmental degradation being the most turbulent. One major obstacle that has continued to plague the oil sector since independence is the issue of transparency in the management and distribution of oil resources. Nigeria, over the last 17 years, has recorded huge earnings from the petroleum industry, amounting to N77.348 trillion but had been unable to utilise the funds to improve the lives of its citizens, neither has the country used it to develop the economy. Specifically, data compiled by the Central Bank of Nigeria (CBN), showed that Nigeria earned N77.348 trillion from the oil and gas industry from 1999 to 2016. Analysis of the various oil and gas earnings showed that the country recorded gross oil revenue of N77.348 trillion over a 17-year period (1999 to 2016) while net oil revenue over the same period stood at N41.038 trillion. A breakdown of the earnings showed that from 1999 to 2003, the country’s gross earnings stood at N7.329 trillion, while net oil revenue stood at N4.713 trillion; gross oil revenue and net oil revenue from 2004 to 2007 stood at N17.868 trillion and N9.561 trillion respectively. From 2008 to 2011, the country recorded gross and net oil revenue of N23.998 trillion and N13.152 billion respectively, while from 2012 to 2016, N28.153 trillion and N13.612 trillion was recorded as gross oil revenue and net oil revenue respectively. But despite the huge resources earned from petroleum, the country has nothing concrete to show as it is still besieged with inadequate infrastructure, epileptic power situation, low foreign exchange reserves, low savings and an abysmally low standard of living. The country’s currency currently exchanges at about N360 to a dollar. The controversial arrangement was introduced by the Nigerian National Petroleum Corporation (NNPC) under the supervision of the then Minister of Petroleum Resources, Diezani Alison-Madueke, and was quite popular during the Goodluck Jonathan administration. It was an arrangement that involved the allocation of Nigeria’s crude oil to select indigenous and foreign oil traders under agreed swap contract terms, in exchange for refined products for local consumption. Considered an alternative arrangement for the country’s four dysfunctional refineries in Port Harcourt, Warri and Kaduna, the OPA was criticised by Nigerians as a channel for corruption and wastage of the country’s crude oil resources. Apart from the difficulty in getting commensurate value of petroleum products for the volume of crude oil allocated for refining, the arrangement was identified as one of the ways corrupt government officials funnelled the country’s crude oil abroad for their selfish benefits. Under the DSDP option, NNPC directly sold crude oil and directly purchased refined petroleum products from international refineries. The NEITI audit report published on Friday in Abuja revealed that under OPA, the value of refined petroleum products the country received was lower by $723 million than the value of the crude oil allocated to various oil trading firms for refining abroad. The report noted that the huge loss was sustained even after allowances had been made for costs of crude and transportation as well as margins to the traders.